It was the best of times and the worst of times in Washington on Friday, January 18, 2019. Friday, close to half a million women and men packed the mall for the annual March for Life. Most had not yet been born 46 years ago when these marches began. Vice president Pence and the second lady added to the festivities, boldly introducing themselves, “We’re the Pences and we’re pro-life.” President Trump appeared on screen and fired up the crowd by reminding them that our nation is founded on the “nobility and dignity of every human life.” A “Happy march for life” was under way. Cheerful crowds regardless of size make bad video, but hope was on the way. Spotting kids wearing MAGA hats near the Lincoln Memorial, left wing activists went on attack. When the kids responded to their obscenities with cheerful smiles rather than responding in kind, something clearly wasn’t working. But the smiles were enough. Working with what they had, the flower of American press and punditry characterized the kid’s nervous smiles as “smirks” and piled on. Privileged, Ivy League news “analysists” from both parties proclaimed their own virtue by boldly denouncing the “white privilege” of these arrogant Kentucky punks. “Journalists,” fresh from touting the wisdom of Parkland High young adults whom they had trotted out to support their gun control agenda, now excoriated the ignorance of these deplorable Covington High brats. These kids may have had the discipline to turn the other cheek when under attack, but the audacity of wearing MAGA hats, in public, in Washington DC no less, could not be forgiven. This was clearly not journalism’s finest hour. But worse was on its way. 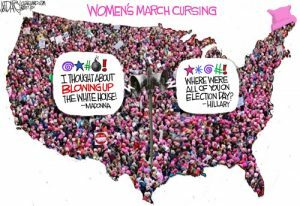 Although more women had marched the previous day, the press proclaimed the Saturday march, the “Woman’s March.” This march included a lot of sign waving. Clever signs proclaimed hatred of men in general, and President Trump in particular. It was inclusive hatred, however. It included hatred for women who opposed the killing of unborn children of both genders. Strangely, it also included hatred for everyone, regardless of race or gender, who supports Israel. Some signs signaled a more global hatred, hatred for the entire human population of every country on the planet. After all, humans cause more environmental damage than snakes. Kill people, not snakes. I didn’t see any pro-snake signs, however. The two marches, one featuring the love of human life, the other its opposite, illustrate the paths that are before us. When I look at the size and demeanor of both groups, I pray that Vice-president Pence was right when he said, “Life is winning in America once again.” The students of Covington High bode well for our future.